It was my first ever social with governors. It was my second year in teaching – All foppish hair, ideals and green ill-fitting corduroy jacket. I had a pint and we moved to the circle of chairs. There were seven of us. I felt important. There was even an ex-Mayor! I sat down opposite a parent governor. There was a low table between us. I was teaching her child. My new head teacher was to my right, leading the discussions. I was in awe of his charisma, his easy charm and knowledge. I so wanted to be like him. Something caught my eye. A crossing and un-crossing of legs -Have you ever seen Basic Instinct? Working with governors is always a complex business. It is a tangle of formal and sometimes informal relationships, business, personal involvement and intricate purpose. Running a school is never easy. I have found that when governance is strong it is easier… when it is not – then it is so much harder. It is one thing working with children, another working with parents, staffing brings further challenges as does working with external partners such as your School Improvement Officer or your Local Authority. They all involve you digging deep into your reservoirs of empathy and communication. Working with governors can feel like working with all of the above, at once… in one room. A week after my close encounter I decided to share my experience with my teaching assistant. The first and very last lesson I needed to learn about confidentially! Little did I know, she was best friends with the parent governor – they shared everything. I have erased the 1 to 1 meeting we had to have to, ‘clear the air’ from my cortex. What makes effective governance? As I do about headship. I often come back with the answer – focus. When I have gone in to support special measures or schools requiring improvement I am never surprised at how far from very simple and basic focus the school has slipped. I blame governance for this. This is usually reflected in an 80 page school development plan. In the early days governors had an excuse. They were there for heads to tell them how well the school was doing. Today, they are there to check that the school not only knows how well it is doing, OR NOT, and is utterly clear on what it is doing about it. How well do you link content to purpose? So why does it go wrong? Well in the past all of these have happened to me. I sometimes wonder if there is a magic silver bullet in how to do effective governance. 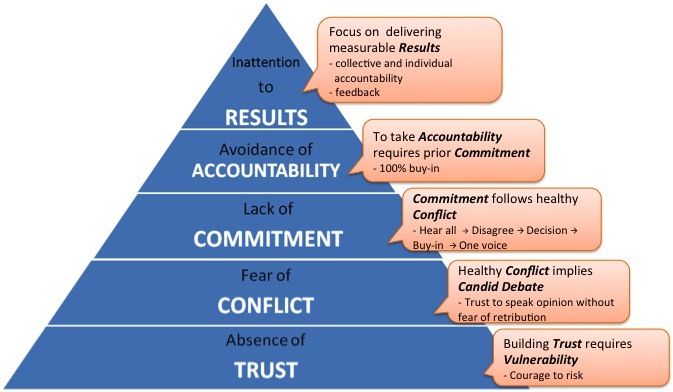 I quickly realise that no one model will fit but I re-read Patrick Lencioni’s book the 5 Dysfunctions of a Team this week. I love the book because it is reflective of all the teams and partnership I work in. I found it really helpful when thinking about governance. TRUST – this is the most important one to build. At the core you have to build trust. There are many ways to do this but at its heart you need to take a risk and use those skills of emotional intelligence to get to know the people you work with. See their side. This can be hard when you just want to get on with the job. But the best governors I have worked with have mentored me, saved me and helped me grow time and time again. That only happened because they knew much about my strengths and weaknesses and I knew theirs. I call it naked leadership… though never to anyone’s face! It’s never easy being told you have 22 spelling mistakes in your heads report. But when trust and agreed focus is there it matters less. People need to feel they can speak their minds… but this has to be about the FOCUSSED PRIORITIES… not the fact (as has happened in the past) they dislike you wearing PE kit, having a 5 o clock shadow or declaring you are an atheist. Being a governor is a noble job. I feel good because I work in education. A governor is a volunteer…They do this for NOTHING? This is never really given the praise it deserves. You still have to do it well. Being a governor and never turning up (Not naming anyone Labour MP of Bristol!) is NOT being a governor… But a hardworking, caring, focussed and supportive governor should be given the highest accolades for their service (I received some Bristol Blue Glass for 15 years of late night meetings and shared success and failure). I don’t believe it should be a paid role… BUT it should be given public service recognition. The number of times I have worked with schools and the governing body have shrugged their shoulder as if to say, Nothing to do with us! It was the heads fault! That Leadership judgement… It is NEVER about one person. If it is, then that is a very different type of leadership… that is a dictatorship. These should be hunted down. They are not good for education. Everyone looks away as if to say, not my fault… but schools need succession. Schools need to be able to flourish in the future… Governors are the long term link. If the head goes… the governing system will still be there and this system is KEY to the schools future. The system should not gamble on lucky breaks. In the world of schools I would broaden this to standards. ‘Results’ is too focussed on easily measurable (*though not always accurate) outcomes for me. Schools are driven on data heavy results. In some ways this is easy for governors to account for… But there are other standards that governors can fight for. In one school I worked in, after years of rising results a governor said, “Enough is enough… we know we have the systems in place to keep high standards rolling on. I am not saying we lose focus here… but surely we want to widen our curriculum and develop other things rather than pursue even higher academic results?” That was a very wise governor. One who knew that the core focus was in place and therefore we had an opportunity to develop bigger stuff. This resulted in a glowing outstanding Ofsted which picked up on all the aspects of schooling we did. School governance, at its heart, should be about ensuring the best possible future for the school and therefore all its stakeholders. Often we should follow our basic instincts because these usually lead us to do the right things. But, there are some basic instincts that should be avoided, especially in school governance. Reblogged this on The Governor Echo Chamber.